I love this program. I have been using the trial on and off for a long time, but recently purchased it for work. The fact that it will back up the running configs automatically at night for me alone is worth it. The part I like the most is that when it senses a change in the running config it will copy the old running config into a separate folder and backup the new config. Then it will email me when it has finished and include a zip file with all the changes per config lined up side by side so I can see exactly what has been changed. This is a great feature just in case you had a rogue admin go around and make changes you didn’t approve of. You just simply open up the HTML change file for Router A and you will see the highlighted changes between the old and new running config. Sorry for the lack of updates I have been super busy with work and real life. Plus I have been working on the Internetwork COD material strickly and there really isn’t much to report on those. I have moved slowly through them since I usually work with my lab during the class, pausing it at times, or working with my lab a few days after the topics are discussed. I am moving into the OSPF classes this weekend and aiming to have all of them completed by Sunday. This way I can work on the topics more in depth during the week. He did some switching work to verify that STP was indeed causing the green to orange lights on the switchport read outs. Interesting characteristic that we were only seeing on the 3560’s and not the 3550’s. Sorry for the lack of updates but it has been a busy week. I have been doing the frame-relay section of workbook one and doing my own labs as well. Nothing ground breaking here since it is only frame-relay which atleast I have used up to five years ago. I do miss it at times . I am going to start moving farther into the class on demand stuff this week and hopefully get farther along into workbook one. I did finish up Day 1 part 4 this the other night. I go a bit slow because I like to work things out as they do with my own lab. It works pretty well, but a bit slow. I am hoping to get into the Frame Relay COD’s this weekend, but I have my daughter and I am sensing some Barbie parties happening. I am hoping to atleast get through workbook I switching lab during the late night over this weekend. This question is Jeff Doyle’s favorite interview question. I wonder how many people get tripped up by this little question in an interview ? You can read his whole post at his blog. You guys should check out Doug Kenline’s site listed under my Blogroll named “Layer 1 Transport”. He blogs on a lot of topics and has all different sorts of topics flying around. It is very entertaining and informative. I think I have even seen some posts within the last few weeks with his work notes in them. My site would probably get shut down if I put my work notes online here! Anyways it is a good site to check out along with my other CCIE blog links. All I would like to know is when is the Cisco Certification Fantasy League draft and who is the census number one pick ? I only got through the first section named Ethernet Switching tonight. Internetwork’s classroom server was offline for a while when I got home and tried connecting so I lost some time. I did get four solid pages of notes though that lead to some insight here on my own switches. Well I took a little over a week off since passing the written to finish some stuff up around the house like our roof! Some break I had! Well tonight I am hoping to get started with the Internetwork Expert Class on Demand material with the switching segment. With my Dynamips Mac Mini setup to the real switches running smooth I am hoping to work with WorkBook I as I work through the COD’s themselves. I have a Cisco doc dvd yearly subscription at work so this will help as well. This is where my studying and lab time will become methodical. I need to get everything to sink in and stick with me. With Cisco bumping up the lab fee to $1400 per attempt along with the six month wait time for a open lab slot this makes the first attempt become ever more important. This came from Ethan Bankâ€™s blog site. I have been looking for a path to take once the written was finished and I believe this will be the one. 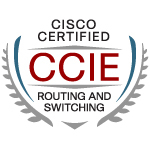 Some people are getting worried the new certification paths will hurt the CCIE. I don’t feed into that at all. Everything I read on these paths is that they are all Design based. What this is will do I believe is just create two pyramids for Cisco certifications instead of one. Michael Morris’s blog article on this.